Muscle Garage "You Can Never Have Enough Toys"
T-shirt colour: Available in Black Only. T-shirt artwork orientation: Large detailed artwork on the rear of the Tee (as shown above). 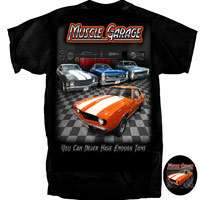 T-shirt artwork configuration: This GM Muscle Car Tee is 100% Pre-Shrunk Cotton with brilliant artwork illustrating the perfect Garage at home. In the foreground we have a gorgeous 1969 “Hugger Orange” with White Racing stripes Chevrolet Camaro, whilst in the background ready when you are, a 1971/2 Chevrolet Chevelle, 1966 Pontiac GTO, and a 1966/7 Chevrolet Nova ...How cool are these beauties? The art work on the front of the Tee is of a smaller scale Hugger Orange 1969 Chevrolet Camaro on the chequered floor, located on the left side of the chest. A very collectable piece for the GM muscle car enthusiast indeed!